Science Notes 2011, the latest edition of SciCom's annual multimedia magazine, was spotlighted in two national blogs devoted to science writing: the Knight Science Journalism Tracker and "The SA Incubator" at Scientific American. Stories produced by student journalists in the class of 2011 explored the lives of sneaky salmon-snatching sea lions, threats faced by African island tree frogs and octopus-shaped sand dollars, and a purge-inducing, shaman-administered hallucinogenic Peruvian brew. During SciCom's multimedia class, the writers also produced a podcast for each story, numerous videos and slideshows, and still photography. The magazine features original artwork from graduate students in the Science Illustration Program at CSU Monterey Bay. Veteran journalist Charlie Petit, head blogger for the Knight Science Journalism Tracker, wrote this in his post about the magazine: "Every year the UC Santa Cruz science communication program—among the most successful formal, pedagogic producers of career science journalists in the country, with its specialty the conversion of researchers into reporters—publishes its fellows' magazine-scale features. The result is Science Notes. This year's issue is pretty good and in several places truly outstanding." And at Scientific American, in a long post solicited by blog editor Bora Zivkovic, the authors offer inside looks at how their stories transpired. For example, Susan Young noted this about her story on new smartphone apps to help blind people navigate their world: "Writing my first feature solidified for me the importance of hidden sources—experts and stakeholders whom I interviewed, but didn’t quote or mention directly in my piece." And Sandeep Ravindran, who produced both a slideshow and a video to accompany his story on lizard families, wrote: "I certainly gained a whole new appreciation for field-research documentaries!" Other stories in the issue describe the perils of honeybees and the promise of native bees for pollinating California crops; glitchy video-game coding through the eyes of an upstart software engineer; field excursions with biologists tracking mountain lions above Santa Cruz; why some channels in Elkhorn Slough are turning a disturbing pea green; and how gigantic transnational gold mines affect the agrarian residents of the Andes. The authors are now working at national-level internships and jobs. 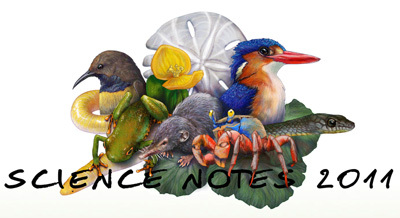 The next issue of Science Notes will be published in August 2012.